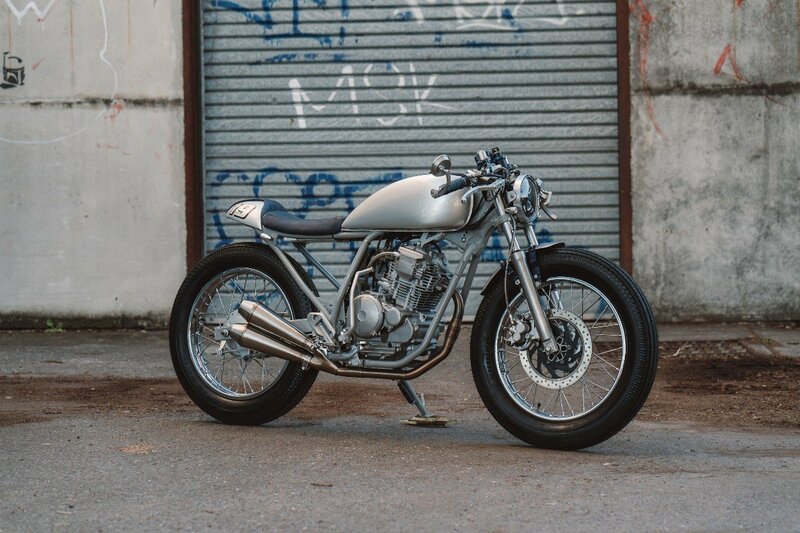 The Straight Street Yamaha Scorpio Cafe Racer. 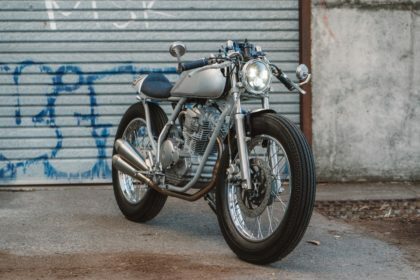 The Yamaha Scorpio is a bike that’s almost been done to death overseas by custom shops. Huge in Indonesia and Deus have had a go at a huge amount of them. Come to Australia and you’re pretty hard pressed to find anyone that’s heard of one. I was part of this group before Daniel got in touch. He’d spent some time in Bali and fell in love with one of these less than spectacular machines. On returning he got on the hunt, found one in Brisbane and being from Townsville, he had it delivered down to my garage on the Gold Coast. Being a 2007 bike didn’t mean much here, it has had a rough life and was in serious need of some pampering. 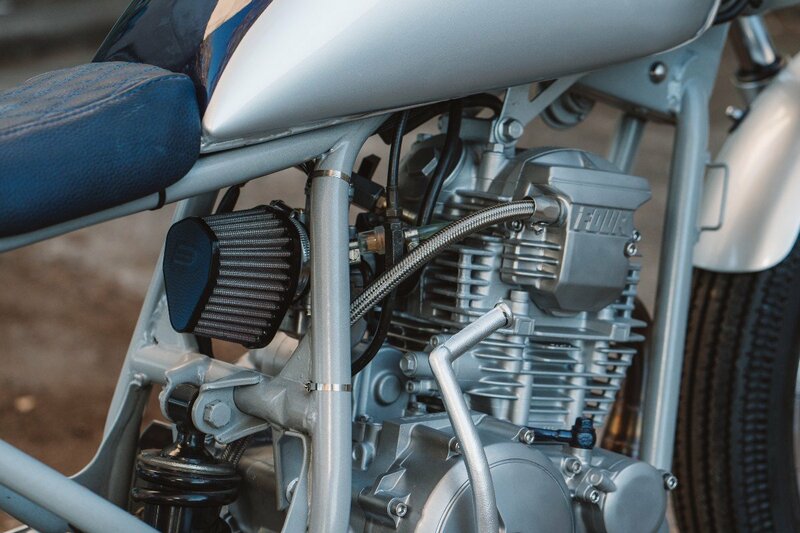 To understand the process of how we pick out our cafe racer parts, click here. Tearing the bike down revealed a simple and classically set frame, a tidy monoshock set up and some nice chrome rims. Pretty much everything that made the bike a Scorpio, bar the engine being removed. 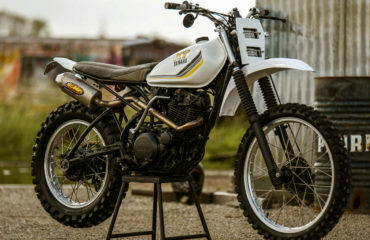 I’d seen a million and one Beach Hoppers, Trackers and Scramblers done with these bikes, but I was yet to see a pure street attempt of a custom Yamaha Scorpio. The bike isn’t fast and with that, to give the rider as much enjoyment as possible you need to accentuate the fun factor. 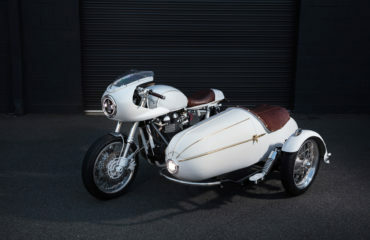 The bike would be stripped bare and built to be enjoyed anywhere from city traffic to a nice windy road complete with some modern classic style. 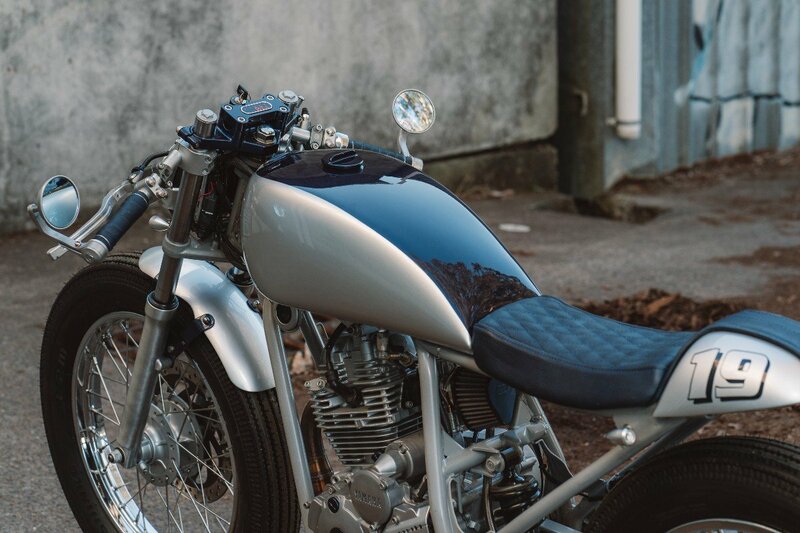 Starting with a new custom tank, the seat and tail were hand made and shaped to suit. 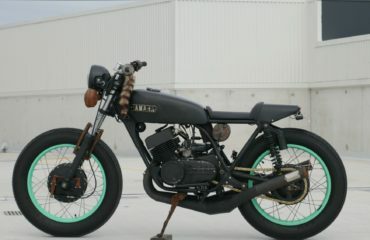 The tail/seat couldn’t have any visible mounting points so I went with a leather strap + integrated tail light. Tidiest tail I’ve ever made and a little different with the wax pull up blue leather. I was dead set on this leather so had to source it out of New York! Being totally blacked out to begin with, it was a lot of work to get to the all silver with blue highlights that I wanted. 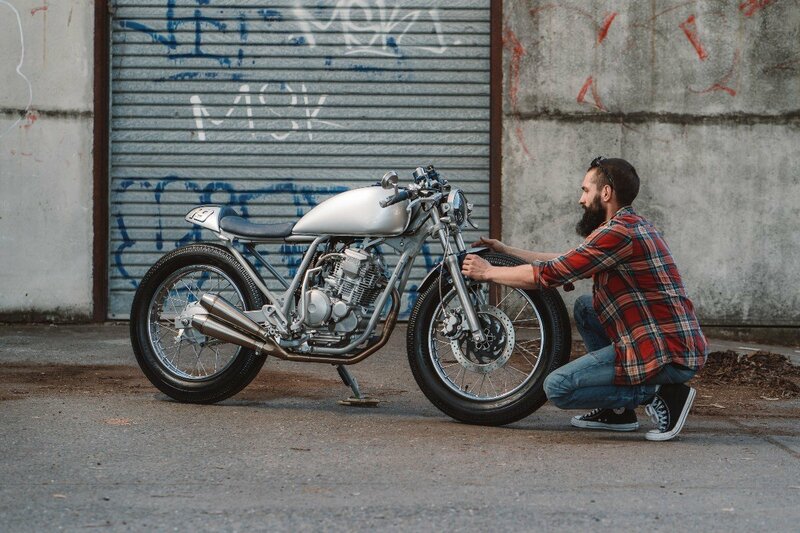 This meant a total re-powder coat of the frame, blasting of the engine, stripping the forks, polishing the cases and painting near on everything else. On stripping the engine + carb I found not 1 but 2 cross threaded and jammed in parts in the carburetor. 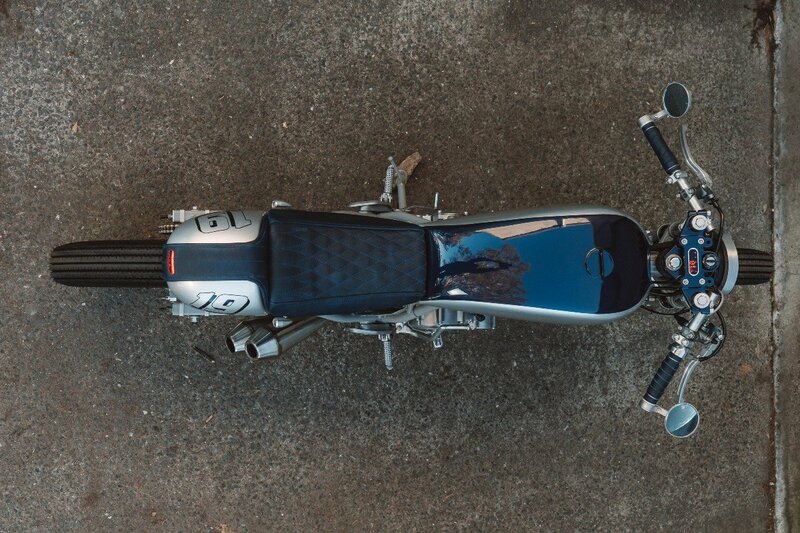 I took it as an opportunity to replace it entirely with a KOSO 30mm Flatslide carburetor, backed up with an all new DNA leather top pod filter. 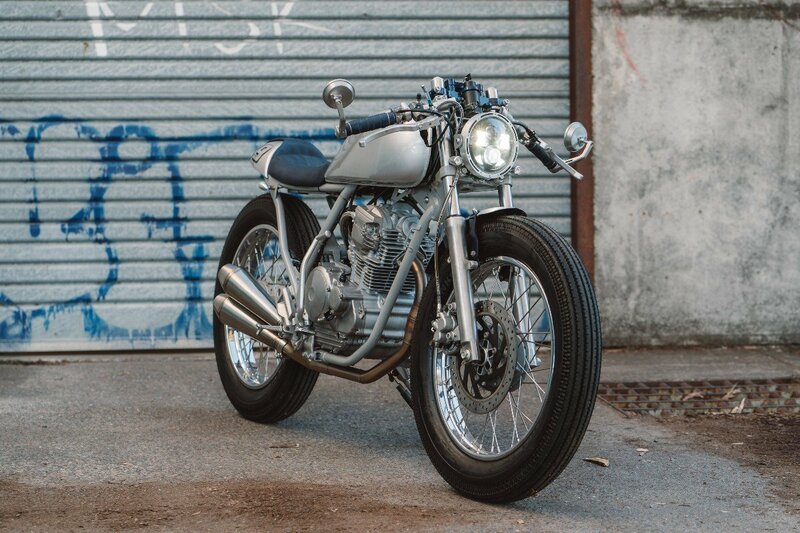 The Custom exhaust on this one is a gem. 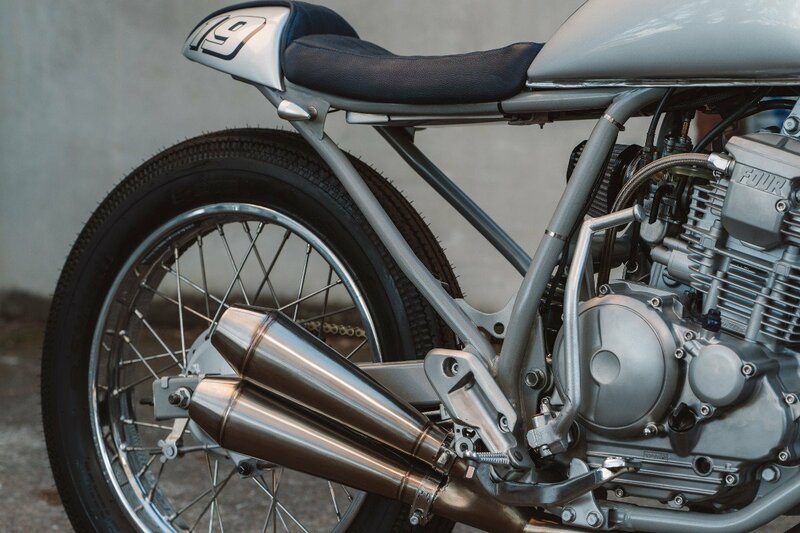 The single cylinder breathes through an all stainless system, featuring an anti reverb chamber and dual single sided 43mm torpedo mufflers with internal torque cones to keep it from breathing too wide open. 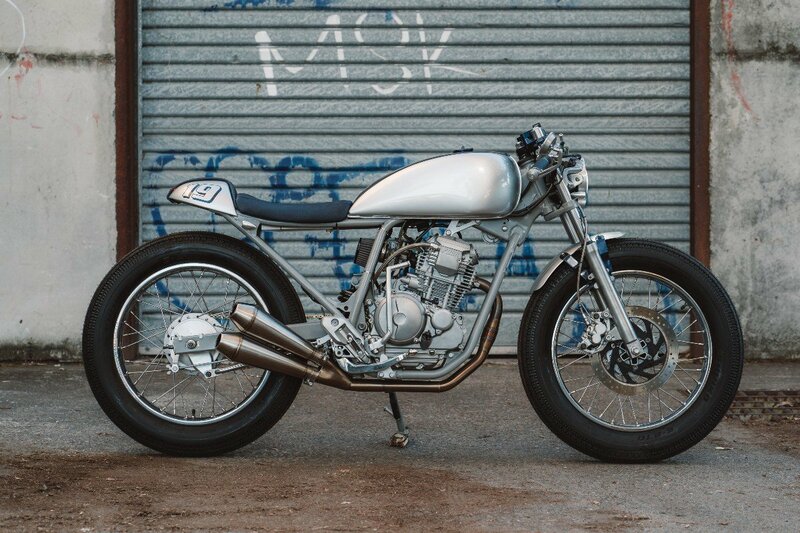 Other touches include, re-laced wheels, custom Motogadget Motoscope mount, trimmed up fenders and clip on bars with upgraded levers/throttle. From head to toe the electrics on this little rip around were given the PBM treatment. From the upgraded push button switches, tucked away starter controls, to the New release V2 indicators and prototype Solar flare LED headlight set for release July 2017. Also Tucked away neatly are the brains of the operation, the latest version of the Black box control module. The finishing touches before assembly were a Midnight Blue and Silver paint job with some classically styled Shinko E270 tyres. From where it started the Scorpio is almost unrecognizable. 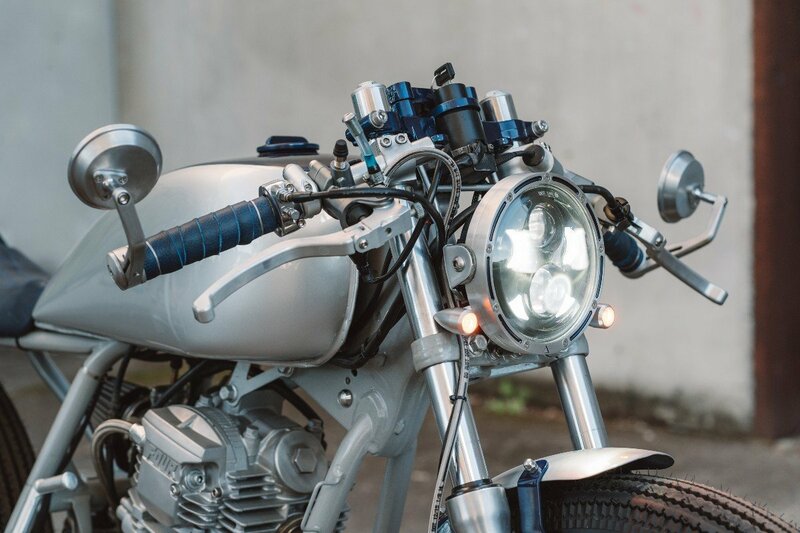 The lines have been straightened out and the Scorpio received a café racer touch of class. From the get go I was skeptical of the lengths of modification the rider wanted out of such a small bike. I have well and truly had to eat my words on this one, the Scorpio is a blast to ride. The snug riding position, and super light handling really lets you ring out every bit of power the Yamaha has to offer. It’s no super sport, but around town and through some tight corners, you can’t get the smile off your face.